The BoE of surprised markets by not only doing the 25bps rate cut expected but by unexpectedly restarting the QE programme. An addtional £60bn of bonds will be bought, taking the total up to £425bn. The currency fell at least 1.5% against most currencies. However, purer domestic stocks only rose between 0.5% and 1.0%. The FTSE 100 rose 1.5% reflecting the drop in GBP. Gilt yields responded with shock to the extra buying as the 10 year gilt yield plunged back to post-Brexit lows. In addition to cutting Bank Rate, supported by the introduction of the TFS, the MPC has voted to expand its asset purchase programme for UK government bonds, financed by the issuance of central bank reserves. This will trigger portfolio rebalancing into riskier assets, lowering the real cost of borrowing for households and companies. Thus, in tolerating a temporary period of above-target inflation, the Committee expects the eventual return of inflation to the target to be more sustainable. The toleration of below target inflation has been so pervasive that the BoE was perversely threatening to raise rates for most of 2015 and so consistently tightening monetary policy. The complacency of George Osborne, the previous Chancellor of the Exchequer, towards this policy probably contributed more than anything to his downfall. the economy. In these uncertain times clarity about our macroeconomic framework is vital. that monetary policy can play its role fully. 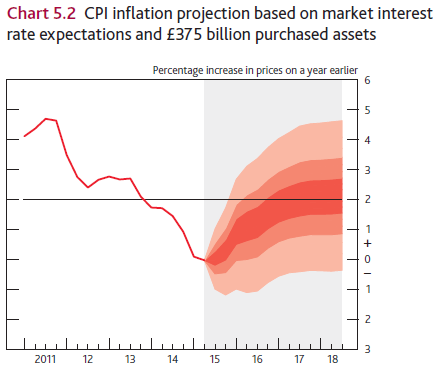 The problem is that the BoE targets a fiction which, as its author, it closely controls: the central projection for CPI 2-3yr out. Several times over the last 18 months it has modelled an upside breach of the central 2% projection. Sometimes it has threatened to tighten as a result, sometimes it hasn’t – but always promises vigilance and a bias to tighten. It is inconceivable the BoE would ever project a downside miss to the target in 2-3 years’ time. By continually overestimating current but not future inflation, monetary policy remains tight forever. Remember that CPI inflation has been consistently below 2% for several years yet Carney has been tightening for nearly 18 months with his threats of rate rises, and only rate rises, sooner or later. The result of this focus on projected and not actual CPI has been a slow strangulation of real and especially nominal economic growth. By ignoring the terribly weak NGDP growth of the last 12 months Carney is now almost happy to have something else to blame other than the BoE’s own failure to not only act to boost aggregate demand earlier – but for contributing to the slowdown. Much of this revision [to RGDP forecasts] reflects a downward adjustment to potential supply that monetary policy cannot offset. 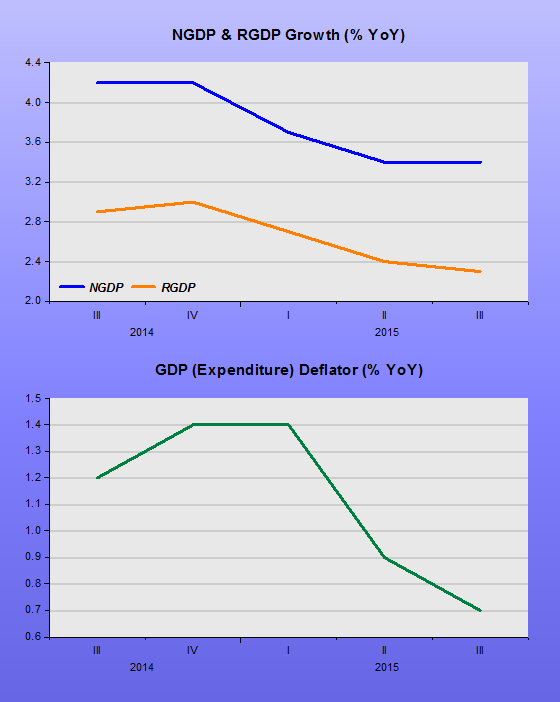 However, monetary policy can provide support as the economy adjusts. The Bank’s excessively strong negative views on the future trade policy of the UK remain notable and are a continuation of the anti-Brexit campaigning we saw during the referendum debate. The BoE has been so wrong about so much when it comes to forecasting, that it really should show more humility, and stop targeting its own “fiction” of future inflation. The bond markets clearly do not believe the BoE inflation projections. Carney should be a worried man. The BoE expected investors to flee UK bonds post-Brexit. They flocked to them. The BoE expected its corporate bond QE to lead to investors fleeing UK government bonds. They flocked to them instead. Carney stated that the bank had done huge amounts of thinking about this package. Clearly perspiration is no substitute for inspiration. Mark Carney gave a speech at 4pm today that clearly eased monetary policy and raised NGDP growth expectations. Sterling immediately fell 1%, gilts rose 1% and stocks surged. What had he said that was so good? Essentially this: The fall in Sterling would push up domestic inflation and not only was he OK with that but he also expected he would have to ease monetary policy even further. Finally, as expected, sterling has depreciated sharply. For given foreign demand, this will mean support to net trade, though this may well be dampened by uncertainty around future trading relationships. A lower exchange rate will also entail higher prices for imported consumer goods, energy and capital goods, and consequently lower real incomes. As the MPC said prior to the referendum, the combination of these influences on demand, supply and the exchange rate could lead to a materially lower path for growth and a notably higher path for inflation than set out in the May Inflation Report. In such circumstances, the MPC will face a trade-off between stabilising inflation on the one hand and avoiding undue volatility in output and employment on the other. The implications for monetary policy will depend on the relative magnitudes of these effects. In my view, and I am not pre-judging the views of the other independent MPC members, the economic outlook has deteriorated and some monetary policy easing will likely be required over the summer. We have been consistently critical of Carney due to his instigating a crushing slowdown in NGDP growth during 2015. It has dragged down RGDP growth and made the UK vulnerable to shocks, like Brexit. To be fair, he is only one of many central bankers with the same mindset of inflation-phobia that blinds them to weak NGDP growth – and one shared by most mainstream economists and many financial types. He didn’t help his credibility by taking sides in the referendum debate warning of potential long term damage to the economy. No one can predict with any confidence what the economic outcome will be given the huge unknown of the future political and trade relationships. These are political issues on which he was badly trespassing. 95% of economists reckoned an 8% loss of RGDP by 2030, roughly what the domestic FTSE 250 index fell. It’s an approximation that will depend on the politics. The politics quickly became a huge mess, but is gradually being resolved. The FTSE 250 is recovering. A big help has been and will be the devaluation, a natural offset to economic damage from political uncertainty. Carney has now not only blessed the devaluation but vowed to protect it. So credit where credit is due. In May, the MPC judged that a sustainable return of inflation to the 2% target probably required a gradually rising path for Bank Rate over the next three years as growth picked up, jobs and wages increased and the drags from a stronger currency and lower commodity prices faded. To get inflation up he needs to tighten monetary policy? What? It still shows he is badly confused about his role even if he seems to be a good man in a crisis. The sad thing is that he is partly responsible for the crisis – a characteristic of far too many of today’s central bankers. Mark Carney is supposedly handsome, but I don’t really feel qualified to comment. One observation I would make is that handsome friends seem to be prone to unreliability. A bit like Hugh Grant, allegedly. Carney’s lack of commitment was made clear from the day his appointment was announced when it was revealed that the new standard eight-year term for Governors of the Bank of England would, in fact only be five years for him, a special concession he negotiated. Mmm. At Christmas a puff piece on Carney in the FT was followed two days later by a (related) story indicating he was now willing to make himself available for the full eight years . Mmm. Rather like a Premier League footballer he remains open to offers. Mmm. Carney floated the idea of NGDP Targeting back in December 2012 only to never mention it again. Mmm. He has also talked of fairly concrete “thresholds” for monetary tightening over the years, only to ignore them when they are passed through. Mmm. He has talked of “forward guidance” only to see that guidance ripped up as the “forward” time has arrived. He was reportedly very tetchy at the press conference presenting the February 2016 quarterly inflation report. One tweet from the meeting suggested that he had said all members of the MPC agreed that the next move in rates would be up. I searched for confirmation in the official minutes but could find none. Mmm. He has now rowed back again, apparently. In regular testimony to the House of Commons Treasury Select Committee he now says that the next rate move could be up or down, that the period to reach the 2% goal could be extended. He has even flirted with negative interest rates, the last refuge of a failed inflation-targeting regime the world over. Extending the period to reach 2% is not a good idea if the goal is still the Bank of England’s own expectation of 2% inflation two years’ out. The constant threat of tightening every time their medium term range of expectations biases above 2% effectively tightens monetary policy, killing any hope of achieving the objective – thus depressing nominal growth lower and lower. He is not really fit to be Governor, except that another candidate might be less reactive and more hawkish, like a new Mervyn King, and equally disastrous. An unreliable boyfriend is better than a violent one. Personally, I blame Carney’s “dad” for this behaviour, Chancellor George Osborne. He needs to set firmer rules of behaviour. Broadening the inflation target regime to one of NGDP growth expectations targeting. A stable path of expected nominal spending, income or output – depending on your school of macro-economics – is all that is required. This stop-start monetary policy of targeting the Bank of England’s own inflation expectations two years out is just self-defeating and ultimately damaging nonsense. George Osborne: I’m proud of you today! In a “currency war” it pays to be the loser. If you need an expansionary monetary policy, like most currency blocs today, don’t let anyone undercut with dirty devaluations. So, when a big baby like China decides to lower the value of its currency versus the biggest baby of all, the USD, make sure you are not caught in the cross fire. George Osborne’s “dangerous cocktail” warning about foreign threats to UK economic growth was very well timed. And had the desired effect of weakening Sterling against both the USD and the EUR, and even against the weakening CNY. Good one George! Of course, he has to do the heavy lifting on monetary policy thanks to his AWOL Governor of the Bank of England, Mark Carney. He seems to prefer commenting on Brexit, Climate Change, inequality and phantom inflation threats. On the one he can influence, he’s wrong. Deflation is the more dangerous threat and it would be great to see him showing some interest. Draghi isn’t alone among central bankers struggling to convey their message. Bank of England Governor Mark Carney was labeled an “unreliable boyfriend” by a U.K. lawmaker last year after he first told investors they were behind the curve, then two weeks later said there was more spare capacity in the labor market than thought. Yellen has faced criticism this year for holding off on a decision to imposing the Fed’s first rate increases since the financial crisis, contrary to previous signals. What this implies is that “communication” does not matter very much. What really matters is that there´s a generalized expectation that monetary policy will continue to be “good”, meaning that expectations of continued future Nominal Stability (at an adequate level of spending) is pervasive! In mid-2015 Mark Carney stated that the next move in UK rates would be up and that it would come into sharper focus at the turn of the year. This was interpreted as monetary tightening by Market Monetarists and some others. Market prices moved: Sterling, bond prices, UK domestic stock markets as monetary policy impacted future expectations immediately and precisely (ie not in any long and variable fashion). 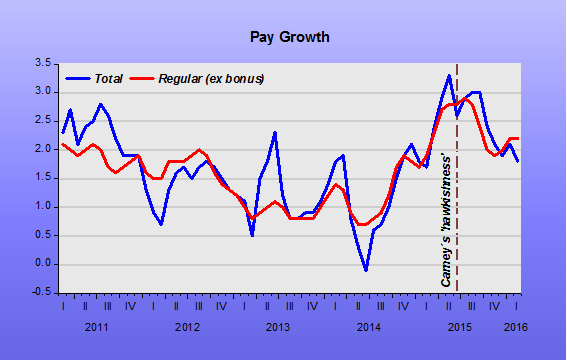 The playing out of the flight path that Carney set in motion is now being seen in the backward-looking actual data. NGDP does not get released in the first estimate of GDP, but the second. The trend seen in some low-level aggregates that we highlighted with the first estimate has been confirmed. 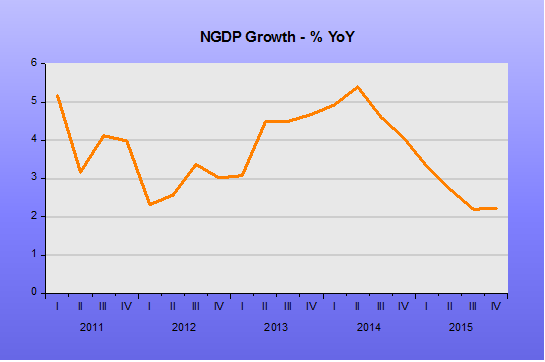 UK NGDP is way off trend at 3.40%, down a touch from the poor 3.42% recorded in 2Q15. 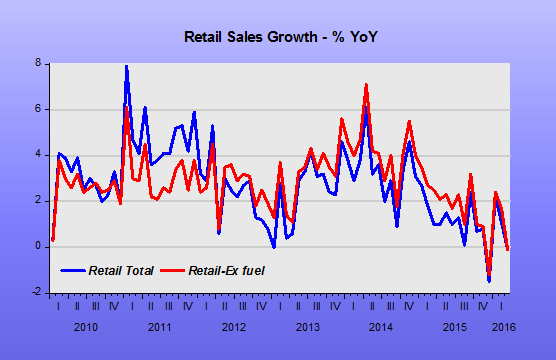 And we already know that this nominal sluggishness is dragging down RGDP. The deflators obviously tell the same story. No inflation here. Perhaps just over 2% RGDP is all that the UK can expect but the downside risks due to a 1%, and falling, deflator are heavy – due to downwardly sticky prices as highlighted by a German ECB Board Member recently. And as yet there are not many signs Carney is alert to these dangers, even if he has pulled back a bit from his monetary tightening language, money itself remains tight as NGDP bobbles along below trend. It’s hard to understand Carney, but by standing pat in the face of this nominal slowing he is ensuring its continuance, that’s the nature of monetary policy – doing nothing is doing something. In his recent extended interview with The Daily Mail Mark Carney not only raised the problem of market-deniers, those who deny the validity of rational expectations in the climate change market. It reminded me of the famous response from the patrician British Prime Minister Harold Macmillan when asked what could push his government off course: “Events dear boy, events“. As his government blundered from mistake to mistake he was eventually booted out for his hopeless response to events, but many of the events blowing him off course were caused by his government in the first place. Central bankers, like Macmillan, seem unable to see themselves as endogenous, only thinking they respond to exogenous impacts. It’s never their fault. As the data comes in worse than they expect they should admit their models are faulty rather than ad hoc blaming new, exogenous, “events”. In fact, it is the markets’ belief that the UK (and US) central banks are itching to raise rates in line with their faulty inflation scenarios that subdues nominal growth and therefore inflation also. The answer is to target nominal growth, not inflation. Is Mark Carney a Market-Denier? Mark Carney is feeling a bit under pressure. His entry into various non-monetary policy debates such as “inclusive capitalism”, climate change, and now Brexit has stirred a few feathers, especially amongst Bank of England traditionalists. Progressives and others from the chattering classes seem to be making less fuss as he mostly seems to be one of them. His spin doctors evidently decided that he needed to try and get back on-side with the more conservative majority in the UK and so allowed a journalist from the right-wing Daily Mail to follow him around for a day and record some of his more informal thoughts. On the big question for the Bank of England, climate change, he was giving no quarter. ‘I was in Lima with the International Monetary Fund and G20 last week and the second most talked about issue was climate change. Is it a bad thing that the Bank of England is not only doing its job but leading the way?’ he asks. Crucially, he argues, it is not outside his remit. London is one of the world’s biggest insurance markets. Insurers are having to take account of climate change fears and risk. It is affecting their capital levels and the premiums they levy. Unlike Scott Sumner I feel somewhat sceptical about man-made climate change. The physicists I talk to seem unsure. Who knows? Anyway, the far more revealing point to me was when he drew an analogy between climate change deniers and market-deniers. It is a paradox. Carney is most certainly not a climate change denier. But is he a market-denier? He appears to have no interest in creating an efficient market in UK inflation futures or Nominal GDP. He denies the market a leading role, or at least doesn’t trust it when it comes to monetary policy, instead preferring the models of the PhD’s in the engine room of the Bank of England. Most mainstream economists are like this, all treating rational expectations as too random, and therefore are all more or less market-deniers. It is arrogant beyond belief, but there you have it, and it causes huge market and economic dislocations as a result. To be somewhat fair, Carney is not like the Fed in denying the market implied US inflation rate. But this is probably because the UK implied inflation curve is frankly unbelievable because of various technical failures. Firstly, it measures an index called RPI that is no longer an “official” UK National Statistic, just calculated as an afterthought because so many index-linked gilts and other long-term contracts rely on it. Secondly, CPI is what the BoE now targets and it runs anywhere between 0.5 and 1.5% below the officially under-resourced RPI measurement . Lastly, it is widely known that the UK pensions and annuity industry, that provides long-term RPI-indexation guarantees, is starved of supply for index-linked gilts causing an artificial shortage. The lack of supply drives up the price and drives down the inflation adjusted return, causing implied inflation to be shown as much higher than it really is. What a mess! Come on Mark, get a grip, help sort it out and stop denying markets a proper role. 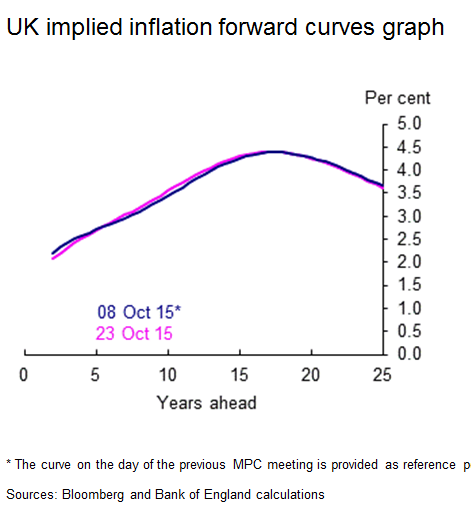 UK inflation expectations are rather unreliable as a result of these technical issues and public confusion. The BoE’s modelled inflation seems very much to underestimate medium term “inflation” versus surveys and market implied RPI numbers given in the BoE’s Inflation Reports.